I love to fly the Alarus. Like many pilots (especially large pilots), I grew up in Cessna 172 aircraft. I have always felt that flying a 172 was much like driving an old car. The field of view in the Alarus is fantastic. There is a blue sky out there! Seriously, the Alarus is a pleasure. It is responsive, roomy, economical, but most of all, it is fun to fly. I am 6’ – 5” tall and weigh more than I will print here. The 46” width is refreshing compared with other aircraft. If you are looking for a fun and tough two-seater or a primary flight trainer, the Alarus is the choice. When my business partner and I formed VOR Holding, we looked at all of the other options. Nothing is close to the Alarus. Our decision was easy. As soon as we had a chance to fly one, we bought two on the spot. If you are a Alarus owner and are interested in VOR Holding managing your aircraft with a flying school, let us know. ALARUS - Conventional But Revolutionary! ALQualified for "best IFR single-engine aircraft for flight training on the market", the Alarus offers a lot more than a basic aircraft. Sophisticated cabin and tough airframe is what the market wants. The 2003 model. As an aircraft reporter, I have flight tested / evaluated more than 70 aircraft from jets to ultralights. There are many new aircraft on the market today but non has been able to successfully penetrate / replace the massive fleet of +30 year old aircraft used by flying schools. The Alarus stands a good chance of doing just that. The Alarus is FAA type certified Utility and IFR. It looks similar to any other classic low wing aircraft (especially a Piper 140). What makes it different is that you can buy one new today with all the latest high-tech safety and equipment. The aircraft was designed for today’s pilot - large cabin area, excellent avionics and inexpensive to operate (5.5 gallons per hour). The gross weight was increased from 1,606 lbs to 1,692 lbs. With the size of the population (and its weight load increasing, the weight standard had to be revised. The FAA quickly approved the weight increase due to the extra design margin built into the aircraft. Let us remember that engineer Chris Heintz, the designer of the Alarus, is also the founder of the brand Zenair, of which more than 1,500 aircraft are flying worldwide. Chris was chief designer at Robin Aviation in Europe before starting Zenair, and was responsible for the design and certification of the RH200 aircraft. More than 2,000 of these certified aircraft are flying in Europe. To have piloted, repeatedly, the Alarus aircraft (where I have personally logged more than 300 hours), I noticed significant improvements to the aircraft interior and finish over the last year model. Obviously, the weight increase is the biggest improvement. Putting the superior performances on the side for now, let us take a look at the structure: The Alarus is undoubtedly the toughest and most simple light aircraft in production. The all metal, semi-monocoque stressed skin construction with internal ribs, longerons, and bulkheads distribute the loads (similar to a Piper aircraft). It is simple, tough and easy to inspect / repair. For flying schools, the simple airframe is very important since it is easy and quick to repair On the subject of toughness, the landing gear system was seriously over designed: One huge 65 lbs. piece of metal goes from one wheel to the other. Spring steel tubing is used on most aircraft. On hard landings, the aircraft bounces back into the air. With the huge one-piece gear system of the Alarus, a lot energy is absorbed on hard landings, minimized bouncing and ultimately making a smoother landing. I noticed that new type wheel axels are used, similar to other certified aircraft. The older axels were not maintenance friendly, making the new axels a nice up-date for mechanics. The nose gear system is not attached to the engine mount or directly to the firewall. No olio type system, no oil seals. A simple self centering super tough bungee system is used (no lifetime limit on the bungee). Direct nose wheel steering makes it easy to taxi the aircraft without using the brakes. At the rear of the fuselage, a massive aluminum tailskid is attached. The tailskid is mount on rubber dampeners for hard landings (another good up-date). On the 2003 model, I was glad to see that the size of the rudder was reduced. The shape and the type remains almost identical. Only the surface area was decreased, making the smaller rudder less responsive. When side slipping the aircraft and applying full and immediate rudder, the effect is classic. The larger rudder is now only used on the “spin certified option”. Cross wind component is unchanged at an amazing 25 knots. After flying the aircraft for some time, I can say that I have landed the aircraft in +25 knot cross wind more than once. Large and responsive flight surface controls make this possible. The powerplant area is far from revolutionary. The classic Lycoming 0235-N2C engine is mounted on a super beefy engine mount (painted yellow). Other than a smaller light weight starter, everything firewall forward is classic. This includes the Sensenich propeller, carburetor air intake filter, muffler system etc. The powerplant area is very similar to the old Cessna 152 installation, using similar parts. This is a big plus for flying schools since they do not have to retrain their mechanics. The cockpit area is manufactured out of Carbon Fiber with molded windshield and side windows. It fits perfectly on the metal airframe (fuselage + wings). The butterfly (gull) doors open on a generous cabin of about 46 inches wide. Seats are extremely comfortable using the NASA type Tetra foam, designed for 26g load absorption, and covered with an elegant micro porous grey leather-like fabric. The latest safety belts are also easier to buckle: the lower-side belt was extended. The center section of the seat belts are fastened to the main wing spar and the roll-over-protection tube between the seats. In flight, visibility is outstanding. Controls feel very nice and forces students to “work the controls”. It’s like driving a new car compared to an old one. Controls do not have any slack and are not sloppy. There is positive feedback so that you feel the aircraft. The rate of climb is quite amazing for a small 116 HP engine. At a gross weight of 1,692 lbs., the indicated rate of climb at 63 Knots was +800 foot per minute. Cruise is slow between 95 and 100 Knots. The slow speed is excellent for a student pilot. I tried a few sideslips with flaps extended. No surprises, no abrupt nose down. Power on stalls are fun because the aircraft is hanging on the engine down to about 30 Knots indicated. Sideways stability is incredible. Powers off stalls are boring with full recover in less than 30 feet. What is very surprising is the positive controllability of the tail and ailerons at the stall. The Flight Manual recommends 60 Knot speed on final, which worked out very nicely. Flaring the aircraft under the stall speed is simple, especially when trimming the stabilator by using the new manual trim wheel. It is exceptionally effective and required little effort to adjust yoke forces. Like most low wing aircraft, the Alarus “sticks” to the ground when landing and does not “float” down the runway. The Alarus is in my opinion, is the best new training aircraft on the market. 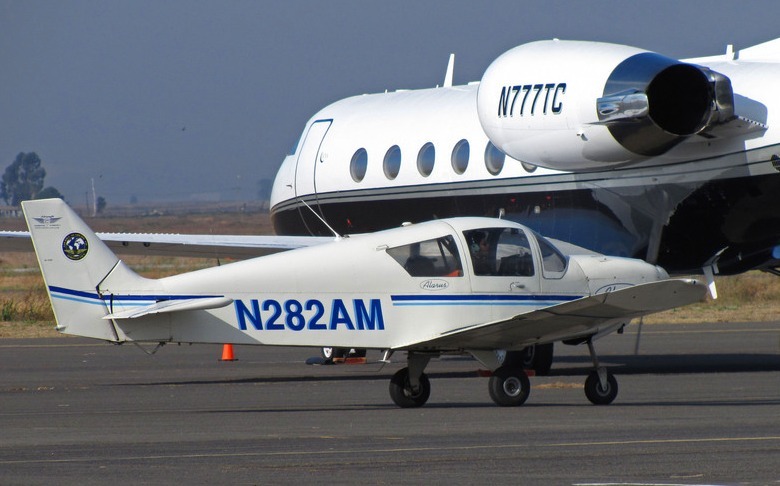 Improvements made over the years has made this aircraft a winner in flying schools. The aircraft comes equipped IFR with dual nav/com’s of which one is the Garmin GNS 430. With the addition of seatbelt airbags, this little aircraft is sure to be a popular training machine. Richard Saint-George - International aircraft reporter, pilot and writer. Having owned and operated Flight Schools for over 20 years, instructed for over 2000 hours, and flown over 18,000 hours in everything from single seat experimental aircraft to state of the art jets, I can honestly say that the Alarus is the most enjoyable, straight forward, Primary and IFR trainer aircraft I have flown. It is exactly what flight schools have needed for years. This aircraft definitely has the right stuff. It is simple, tough and easy to maintain. Its large cabin, high-end avionics, low fuel burn and excellent flight characteristics make it the perfect trainer or personal aircraft. I recently had the privilege of touring the factory in Eastman, Georgia where I met Mathieu Heintz (President) and was able to fly with John Degonia (Company Pilot and Sales Manager). I was extremely impressed with the people and the aircraft. Our tour of the factory began with Mathieu pointing out the many design features of the aircraft such as the simplicity of maintenance, low parts replacement costs, and literally hundreds of design improvements “borrowed” from the traditional Cessna’s and Pipers. The aircraft is incredibly well built as evidenced by the fact that it does not have a single A.D. Note to its name. (Not bad for being certified for over 8 years!) 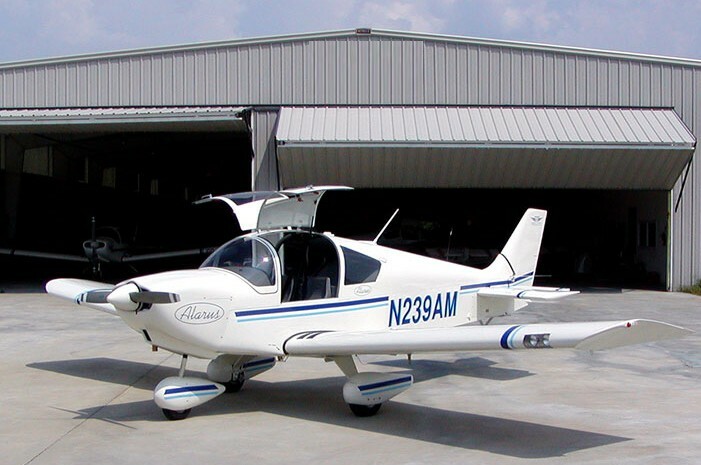 Before purchasing our first aircraft, I talked to several flight schools that commercially own and operate these aircraft, not one person had anything negative to say about it. I think we've all been waiting for the well known advancements in efficiency and performance to make their way into certified aircraft. Finally, a new plane rugged enough for the training mission incorporates up to date design features. Students deserve more than a new panel. The Alarus delivers with noticeable but tame stalls, realistic rudder and yoke control forces, excellent field of view and economic operation. I am also excited to learn that the POH is freely available from the internet. I am sure thousands of students (who are not owners) will want to view the it. I sincerely wish to express my gratitude to you, as well as, for your kind and expert assistance in selecting our new Alarus as TIME BUILDERS, INC. new advanced instrument trainer. Taking delivery of our Alarus with its advanced GPS avionics and certified instrumentation for IFR operation has been a pleasant and most memorable experience. After conducting several months of extensive evaluation we have confirmed that its operation and performance far exceeds our expectations. We find the Alarus to be a serious contender to fill the step between intermediate and advanced complex high performance aircraft. Acquisition and operation costs are minimal. The rules have changed: flying clubs, professional flight schools and academies can no longer afford to keep flying thirty-year old aircraft and expect to break even. The Alarus cannot be underestimated; anyone who says otherwise simply does not know what they are talking about. I suggest that serious "Time Builders" get their orders in today before they wait for more than a year for delivery. Very truly yours, John P. Barelli, Secretary/Treasure - Time Builders Inc. The Alarus is a joy to fly! The controls are "just right", not overly sensitive, but not too forgiving at the same time. This makes it a marvelous aircraft for training. I am a fairly large man and the cockpit is very roomy, (especially when your instructor is a big guy, too). This is highly unusual for a training aircraft. I am strongly considering purchasing a Alarus for myself when I get my private pilot ticket. Great job on designing this airplane! I was asked if I could make some comments on your Alarus. Would LOVE to. handling in the air and on the ground. cockpit. Thank you for making such a great little trainer. The Alarus aircraft is a safe, fun and enjoyable airplane to fly and teach in. The first 3 weeks after receiving our Alarus we flew 75 hours and I was pleased and surprised with the acceleration and climb performance. I expected performance similar to a C-152 but find it to be much, much better. Additionally I really like the excellent cockpit visibility, the roomy and comfortable cabin along with the advanced avionics package make the Alarus a perfect training platform for both primary and advanced instrument students. I recommend the Alarus for flight schools and individual owners alike"
I have flown the Alarus many times during my P.P. training at Corona Flight Academy and its become my favorite plane of all to fly!! Cessna 150/152 and even 172s can't compare, Piper Traumahawks crash and burn! The Beech Skipper is the only close competitor and even they are second to The Alarus!! Its a pilot friendly plane and ultra forgiving to the novice student pilots! I love it! I use it! I recommend it! By the way Greg kimbrough at Corona flight academy takes impeccable care of his Alarus and promotes it to his students over all the other aircraft in his squadron. Need any west coast distribution or sales reps or partners, I'm interested!! Thanks again! Greg Kimbrough purchased a Alarus about three years ago and uses the aircraft for flight training. Matt, could you please send me a new spinner for my Alarus. Send it COD, regular ground. As you know, we had a student go off the side of the runway here resulting a nose gear collapse. I was very surprised at the limited damage done to the plane.... The nose gear bent right at the bottom of the firewall. We replaced the gear leg and bungee. The prop was bent. We had it overhauled and bent back into shape. The engine was not generating power at the time, and we had the crank dial checked. The spinner was damaged during the tow back to the shop. The total cost for the repairs, not including the spinner, was less than $1,200.00. Had it been in a 150 or 172, the engine mount and nose gear system would have been toast, and the firewall would have had to been repaired... We are putting about 500 hours a year on the thing. Great Aircraft! Greg Kimbrough, Corona Flight Academy. "Easiest landing aircraft...Best small aircraft I have flown... the advanced avionics makes this little aircraft amazing and lots of fun to fly... Excellent cockpit management" Neil Kramber, Privet/Instrument/Commercial. GA USA. bump elbows during the flight! "A great and simple training aircraft. My first student soloed in less than 8 hours and got his private ticket in 41 hours total airtime. The 25 Knot cross wing component is very nice. Great avionics. The Sandel HSI is amazing" Gill Trail, IICFI GA USA. I just wanted to let you know how happy I am with our Alarus. As you know, we took delivery of the airplane in January 2000. It has just passed the 500 hour total time mark, having flown 128 hours in August. The reliability of the airplane is very impressive, especially when one considers the airplane is used exclusively for primary flight training. the 128 hours in August were flown without a single maintenance problem. In fact, the only unscheduled maintenance on the airplane since taking delivery was to replace the electric fuel pump. This is a breath of fresh air compared to the rest of our fleet of Kansas built airplanes. Please keep up the good work! I am looking forward to expanding our fleet of Alarus airplanes. Sincerely, Gene Benson, KeyFLight Academy, Inc.
As a new pilot, I love the Alarus aircraft. Excellent comfort and great visibility and responsive controls. As an FAA A&P, I find the aircraft easy to maintain. Simple construction and large inspection panels" Todd Ott FAA A&P with new PPL. "I just wanted to take a brief moment to tell you what a great machine the Alarus is. I earned my private with it, and did the majority of my instrument training in it, including my check ride. The Alarus is a stout, well designed and built aircraft. I fly serial number 20-0049, and in les than one year, my school (Sterling Aviation 904-642-9683 - president - Hayden Malone) has already logged almost 800 hours with it. Great job." Bryan Spink of Jacksonville FL. What the press is saying about the Alarus - Model number "CH2000"
"When John suggested that I stall it, I was ready for anything. The pull on the yoke was silky, no big heaves, no grunting or sweating required, just a gentle command. When the Alarus quit flying it was as if she let out a gentle sigh. I released the backpressure and she was flying again. I was really beginning to like this airplane"
"What matters most in a training airplane is function, reliability, durability, and, course, affordability. And that's what you'll get with the Alarus CH2000" – "The two seat CH2000 is also attracting student owners who want to purchase an airplane in which to earn that first certificate". "During the stalls, slow flight, steep turns and a simulated engine-out glide, the airplane did what it was supposed to without demanding any unusual efforts for me" - "AMD is designing a three-year extended warranty program that will provide wingtip-to-wingtip coverage for all normal wear and tear and all maintenance recommended in the airplane's standard maintenance manual, including brakes, oil changes and annual inspections". "There’s a lot in the airplane that has an appeal beyond the trainer market" - "It’s easy to fly. It’s also economical to operate and maintain, and its relatively inexpensive" – "
"The excellent visibility afforded by the ample glass made spotting traffic in the busy pattern a breeze. Slowing to the 60-65 knot approach speed, the CH 2000 once again exhibited excellent speed stability" – "I even managed a couple of greasers"
"If affordable training is to be available, a simple, inexpensive training aircraft is mandatory. While it costs twice as much as a well-worn used trainer from the 1970's, the CH 2000 has the advantage of a low upkeep by starting out with a fresh airframe. In addition, it has that new-plane cashe -- a rare commodity on the flight line. Expect to see a lot of these little classrooms on flight school ramps." "...splendid and forgiving handling coupled with a price that completely eclipses any other new aircraft in its class. "...maximum value for the money." AVIATION QUARTERLY magazine, Economy Trainer, by Kenneth Armstrong, pages 22 - 26. "Expect to see a lot of these little classrooms on flight school ramps." PRIVATE PILOT magazine, pages 66-69. Flight Report by LeRoy Cook. "I was very impressed with the CH2000. It is easy to fly and will teach you stick and ruddering if you want to fly it well. It's new, roomy, and comfortable, and is cheaper than a Katana. "The bottom line is that if you learn to fly in a Zenith, you will be well grounded in the fundamentals you'll use throughout your flying career, as well as be prepared for an easy transition to your next plane." INFLIGHT USA, cover story by Ed Wischmeyer, pages 55 - 57. "In all areas of performance, design, construction, size, load carrying capacity, spacious cabin, high visibility, conventional controls and uncluttered but full and modern instrument panel, it all leads to an ideal teaching/learning environment. This along with the operating and maintenance costs, a 2400 TBO engine time and a competitive purchase on a fully IFR equipped trainer plus the 3000hr/3 year warranty, we just may have another winner." Recreational Flyer. "Chris Heintz designed the CH 2000 to be a sturdy bird able to withstand thousands of hours in the hands of novices. "And it turned out to be my job to be the first to offer physical proof that the design performs as advertised. "In only 90 minutes the CH 2000 convinced me Chris Heintz did one hell of a job." General Aviation News & Flyer, Zenith's CH 2000: First certified production model has places to go, pilots to train, cover story, by Dave Higdon, Pages 30 - 36. "Put it all together, and it's hard not to conclude that the CH 2000 is the best all-around trainer buy available. That fact that it's currently the only real trainer available doesn't diminish its value as a talented teaching machine." Plane & Pilot Magazine, Light Years Ahead: THE CH 2000, by Bill Cox, Pages 34 - 38. 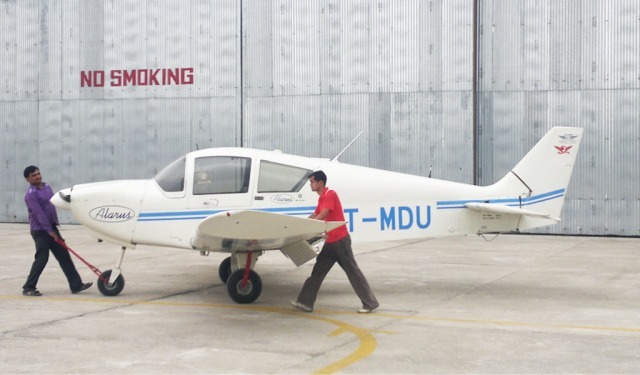 "With a basic trainer like the CH 2000, learning to fly would have been more fun. The all-metal two-seater offers a ready-to-train avionics panel and a view outside for ground reference maneuvers and airwork that's hard to beat." FLYING Magazine, Reaching for the , by Tom Benenson, Pages 94 - 96. "The CH 2000 is a good bet to succeed where more ambitious projects have failed. We predict the airplanes will soon be at work all across North America." PRIVATE PILOT, Traditional Trainer: Lycoming power and aluminum, by LeRoy Cook, Pages 42 - 44. "...the plane is going to be hard to beat, thanks to a combination of desirable qualities, including its low acquisition and maintenance costs, impressive interior dimensions, outstanding climb and landing performance, and overall smooth flying characteristics." AIR PROGRESS, CH 2000, by Robert Goyer, Pages 46 - 50. "From the drawing board to the airways, Chris Heintz' new primary training candidate has all the right moves. "...if I were looking to buy a new airplane in which to teach flying, the combination of the CH 2000's low acquisition and operational costs, its conventional, rugged construction, and its sweet, easy going personality would give me a real yen for Zen." SPORT PILOT, ZEN & FLYING, Zenith's CH 2000 trainer sets a new standard, by Robert Goyer, Pages 34 - 59. "Lots of normal aluminum, a tried-and-true Lycoming O-235, and elegantly stable handling make this a sweet, simple trainer that can be bought and operated for a price that is half that of most of the competition." US AVIATOR, BEST CERTIFICATED AIRCRAFT (NEW). "...the CH 2000 just happens to be a good airplane, with performance that meets or exceeds its maker's claims and a kind of no-frills honesty that will endear it to first-flight students and seen-it-all instructors alike." AOPA PILOT Magazine, ZEN And The Art of New Trainers, cover story, by Marc Cook, Pages 44 - 52. "The CH 2000 offers a great deal to FBOs or schools. The all-metal construction and bulletproof Lycoming are comfortable to mechanics, and the performance is nearly a third better than any of the trainers built back when they built trainers." General Aviation News & Flyer, The latest from Chris Heintz, cover story, Issue, by Jim Cavenaugh, Pages 16 - 25.